Who said doilies have to be crocheted with small thread? This doily is crocheted using medium/worsted weight yarn and still has all the elegance of a classic doily. With the thicker than usual yarn (for a doily at least), it works up super quick so that you can crochet an entire set of doilies in a day. The thicker yarn also makes it a great first doily pattern for beginners. 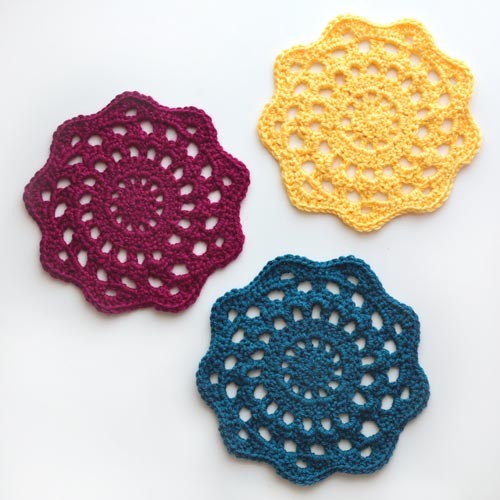 The doilies would look great under a flower pot, candy dish, or even used as a trivet. This entry was posted on Monday, April 30th, 2018 at 12:00 AM by Rachel Choi	and is filed under Best Crochet Patterns. You can follow any responses to this entry through the RSS 2.0 feed. You can skip to the end and leave a response. Pinging is currently not allowed.